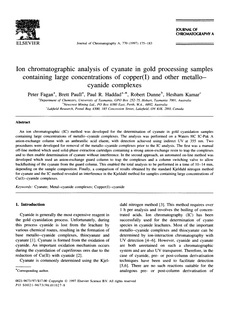 An ion chromatographic (IC) method was developed for the determination of cyanate in gold cyanidation samples containing large concentrations of metallo-cyanide complexes. The analysis was performed on a Waters HC IC-Pak A anion-exchange column with an anthranilic acid eluent, with detection achieved using indirect UV at 355 nm. Two procedures were developed for removal of the metallo-cyanide complexes prior to the IC analysis. The first was a manual off-line method which used solid-phase extraction cartridges containing a strong anion-exchange resin to trap the complexes and to then enable determination of cyanate without interference. In the second approach, an automated on-line method was developed which used an anion-exchange guard column to trap the complexes and a column switching valve to allow backflushing of the cyanate from the guard column. This enabled the total analysis to be performed in a time of 10� min, depending on the sample composition. Finally, a comparison of results obtained by the standard Kjeldahl nitrogen method for cyanate and the IC method revealed an interference in the Kjeldahl method for samples containing large concentrations of Cu(I)-cyanide complexes.